SURIA Bistari Development Sdn Bhd, a wholly-owned subsidiary of IJM Land Bhd, expects to record RM80 million in gross development value (GDV) for its two blocks of SuriaMas suites project in Larkin, Johor Baru. General manager (Southern region) Tham Huen Cheong on Saturday launched the 16-storey SuriaMas Block C comprising 152 units. Tham said 70 per cent of the units, pegged from RM220,000 to RM320,000 had been snapped up even before the launch. Tham said he expects the take-up rate to hit 90 per cent by year-end and the GDV for Block C is expected to be RM35 million. The company is set to launch the 13-storey Block D which will have 119 units by the end of the year, with GDV targetted at RM40 million. The launch of Block D will mark the last of its four blocks of SuriaMas suites in Larkin. Block A and Block B, comprising a total of 600 units, were fully sold out since last year. "Johor Baru's economy is always linked to Singapore. A majority of the flat dwellers are locals working in Singapore. 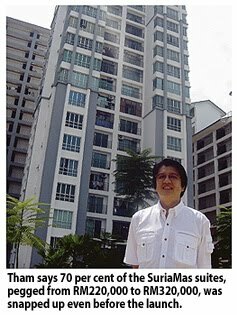 Security is one of the reasons why buyers are snapping up the apartments," Tham said. Meanwhile, the company is set to launch the third phase of its cluster homes in Taman Nusa Duta soon. The third phase consists of 128 units of two-storey cluster homes priced from RM518 and above. "With the new coastal highway here coming up and the cheaper toll rates at the 2nd Link since August, we expect a surge in sales of properties in the area. "Taman Nusa Duta and the neighbouring areas are also poised to be like a duplication of Taman Molek with the sprouting of banks and other amenities in the vicinity," he said.